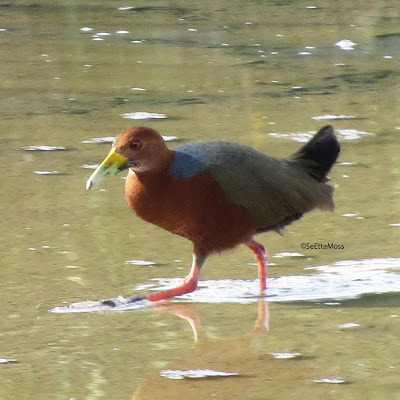 The Rufous-necked Wood-Rail only showed briefly and very early on Sunday morning so I drove up to the nearby mountains to look for birds there where the temperatures were a lot less than the mid-nineties they have been at Bosque del Apache NWR. When I returned in late afternoon the bird had been out for several hours giving it's usual great views to dozens more birders. It came closer to the far end where I was standing and the light was quite good when I got these photos.